Class of 2017 Enjoys Memorable Senior Trip! The senior trip to Washington D.C. was wonderful and embarked without a hitch on that early, chilly Wednesday morning. The cushy bus, with Shirl the fearless driver at the helm, made excellent time to our first stop, the Smithsonian Zoo. Students were excited to see giant pandas Tian Tian and Bei Bei rolling about in their habitat before setting off to explore the zoo. From beavers and bison to gorillas and lions, there was a lot to see. From there, we were whisked away down Embassy Row, turning our heads back and forth as the tour guide rattled off the names of various embassies as we passed. The second stop on our very busy first day was the National Mall, location of seventeen of the Smithsonian museums. 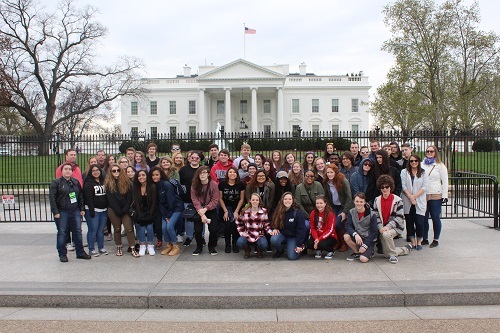 As we lucked out with incredible weather, students were able to walk around the mall, go into a variety of museums, and see such sights as the Washington Monument and exterior of the Capitol. After a delicious dinner at Bertucci's, we headed back to the mall area for a brief monuments and memorials tour that included the Lincoln Memorial (featured in our group shot), the somber Vietnam War Memorial, Vietnam Nurse's Memorial, and Korean War Memorial. Although our tour was cut short for the evening due to some timing and miscommunication, many of us were pleased to get to the hotel and crash for the night! The next day, Thursday, was a bit more cloudy but that didn't dampen our spirits. We first attended a White House area walking tour, which was the location of our second group shot. We were disappointed not to get inside, but made the most of it anyway. We the headed to the Tidal Basin to finish our monuments and memorials tour from the night before. We were able to visit the Jefferson, the Dr. Martin Luther King Jr., and see the stunning cherry blossoms that held on just for us! We weren't sure we'd get to see them at all, given the crazy weather over the past few months, but they were splendid. We then enjoyed a delicious lunch in Farragut Square at some of the local food trucks and restaurants. A surprise visit was made by the Stanley Cup and several students were able to take pictures! We were then shuttled over the Ford's Theater to see a historical presentation about the assassination of Abraham Lincoln. We were also able to tour around the theater's museum. Across the street is the Petersen House, where Lincoln came to his final rest, but as the line was too long that day, we headed back down to the mall for some more free time. Students visited several more museums, art galleries, and botanical gardens. Some even rented bikes and toured around! That evening, after a decadent dinner at Capitol City Brewing Company Restaurant in Alexandria, we headed out for a guided ghost tour around the town. The chilly evening lent itself appropriately to the spooky stories shared by our traditionally garbed tour guides. After our share of giggles and frights, we headed back to the hotel to crash again. The final day was a deluge of rain, which was predicted. We weren't too upset, as most kids were prepared and we thought it would rain the entire trip! We first went to the Pentagon and Pentagon 9/11 Memorial. The rain added to the heartbreak felt at a catastrophe so recent in our history. It also added to our overall saturation, so we headed for the Pentagon Mall to dry off, get some new clothes, and satiate our Starbucks craving. We headed back toward the city after that. The tour guide thought he could get us into the Capitol early, but that didn't work out, so we enjoyed some final free time on the Mall. Miss Sarte and I were able to hike back up to the Petersen House, where there were no lines due to the weather. It was quite an experience that I hope all of the students get to see the next time they are down in Washington DC. Our final stop was a tour of the Capitol itself. The stunning architecture and story behind it were really interesting to learn about. We got to visit the Capitol Dome, National Statuary Hall, and other hidden gems on our guided tour. We also spotted the Capitol Summerhouse on our trek back down the hill. From there we embarked the bus one last time and headed for home. After a brief stop in Delaware for dinner, we rolled into school at about ten at night. All in all, it was a fantastic trip and the kids were incredible. It was so small feat to take 51 eighteen year-olds to a brand new city and keep them organized, entertained, and excited. We hope that they had as much fun as we did in our nation's capital and go back to visit when they are older.